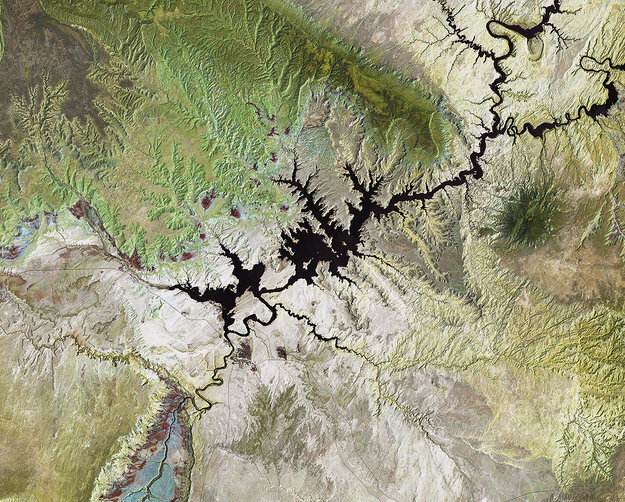 This Landsat image from 19 July 2011 shows Lake Powell, a reservoir on the Colorado River in the southwestern United States. Straddling the border of the states Utah (to the north) and Arizona (to the south), it is the second largest artificial lake in the country. The area to the north of Lake Powell is known as the Grand Staircase-Escalante National Monument, and covers over 760 000 hectares. Appearing green in this false-colour image, the Kaiparowits Plateau makes up a significant portion of the Monument, with the Fiftymile mountain (dark green) separating it from the Escalante Canyons. Another feature of the Monument is the Grand Staircase – a sequence of sedimentary rock layers – part of which is visible in the lower-left corner. 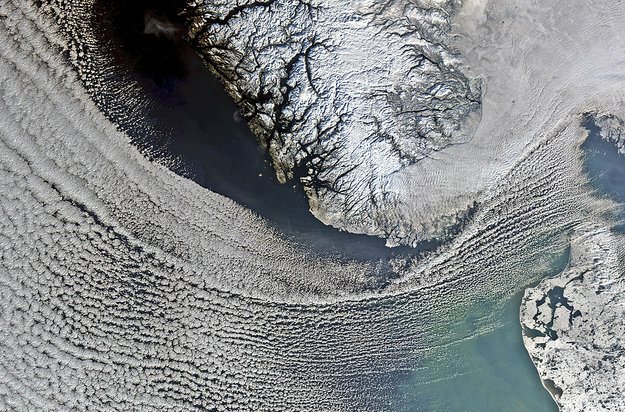 In this image from the Envisat satellite, clouds cover the North Sea and sweep down to the strait between Denmark (lower-right corner) and Norway (upper-centre). In the upper-right corner, a thicker blanket of clouds covers south eastern Norway and spreads into Sweden. Located on the Scandinavian Peninsula, Norway is Europe’s northernmost country and is famed for its fjords. Some of these are visible in the image as dark lines between the white and snow-covered land. Near the top of the image, we can see part of Norway’s longest and deepest fjord, the Sognefjord. In the lower-right corner, we can see part of Denmark’s Jutland peninsula, with small and large bodies of water speckling the flat terrain. An area covering northern Namibia and southern Angola is pictured in this Kompsat-2 image. 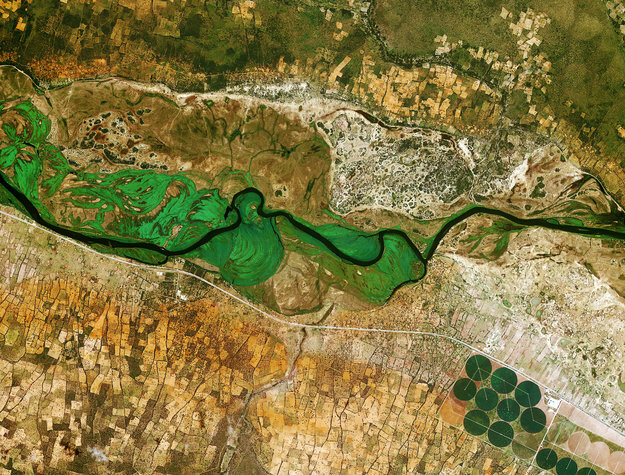 Running across the image, the Okavango River forms the border between Namibia to the south and Angola to the north. Zooming in on the upper left corner, dots of white and other bright colours near a road show rural settlements. The red soil typical of many tropical and subtropical areas of Africa is also evident. In the lower-right corner, we can see large-scale, circular agricultural plots up to about 600 m in diameter. The white lines running through the circle could be maintenance roads. 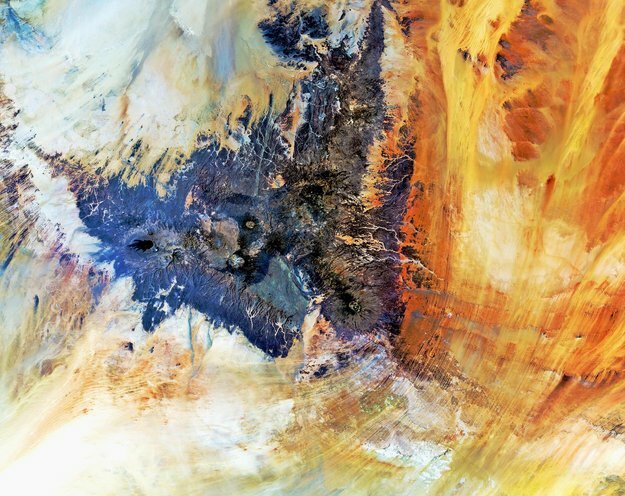 The Tibesti Mountains, located mostly in Chad with the northern slopes extending into Libya, are captured in this image, acquired on 4 March 2012 by Envisat’s MERIS instrument. 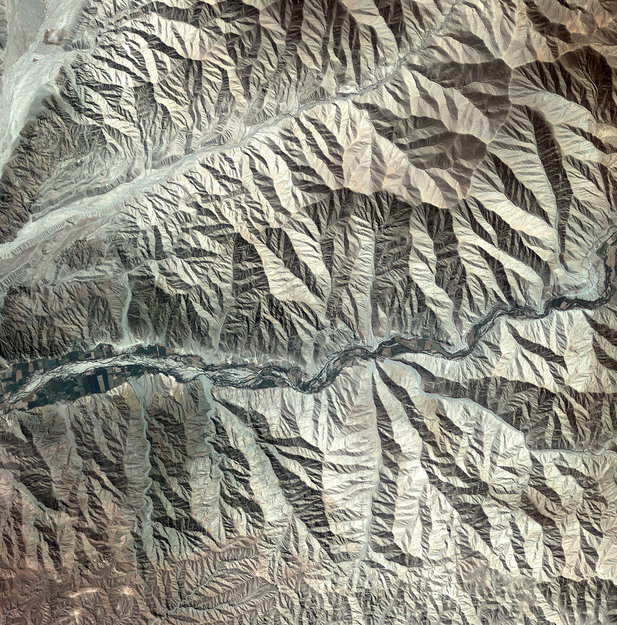 The mountains’ highest peak is Emi Koussi – pictured here as a circular structure in the lower-right portion of the dark area. The westernmost volcano is Toussidé. Our satellite view shows the dark peak with lava flows extending to the left. The white depression to the southeast gets its colour from the accumulation of carbonate salts, creating a soda lake. Surrounding the Tibesti Mountains, the sands of the Sahara appear like orange, yellow and white brushstrokes. 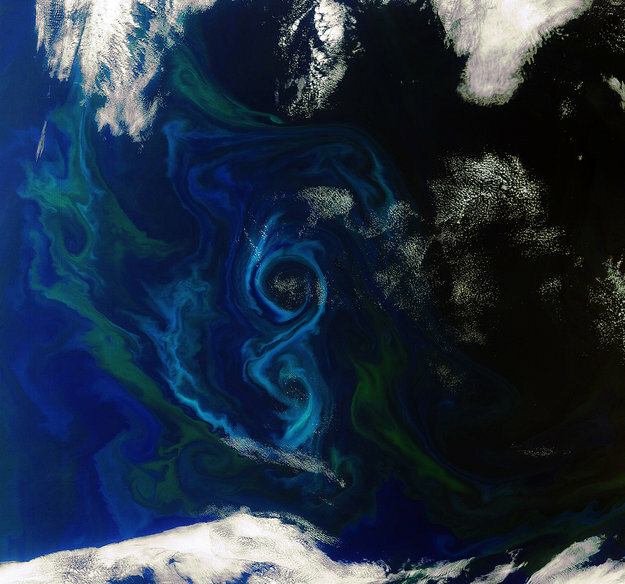 How gorgeous are these satellite photos taken by the European Space Agency? I have talked about how much I love space photos before (here and here), but these remind in particular just how incredible our little planet truly is. Look at the colors! The texture! 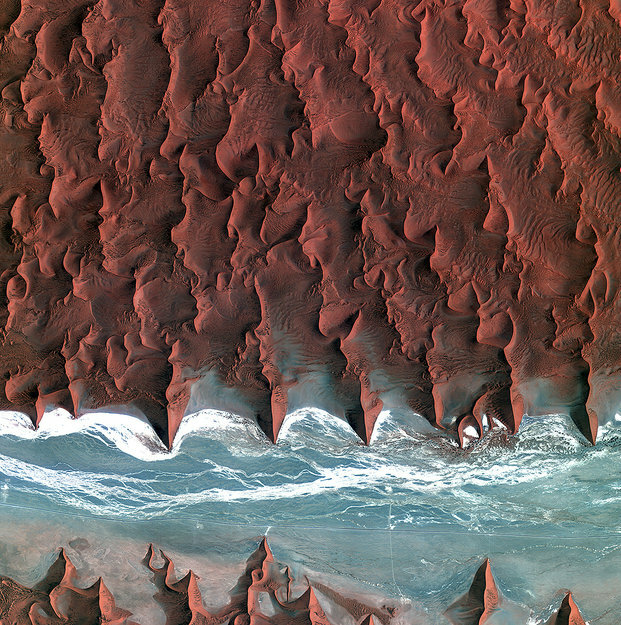 See more gorgeous images of our fair Earth on the ESA website here.